1. 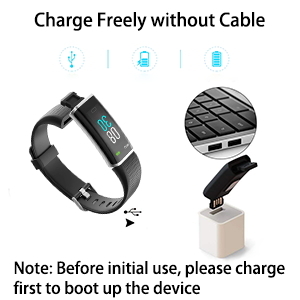 Charge the fitness tracker 1-2 hours before first use. 2. Download and install the free app “VeryFitPro” from Google Play or Apple App Store. 3. Open “VeryFitPro”, tap bind to search the device, choose the device and tap “OK” to bind it. It may take few seconds to show “OK” option after you choose the device. 4. Enable Bluetooth on your smartphone. 5. 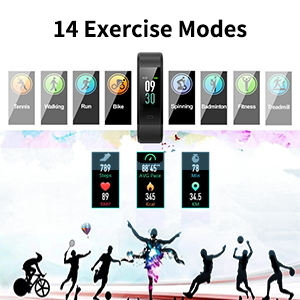 The fitness tracker will connect with your smartphone automatically. You need to enable the corresponding functions on the app before use. If your smartphone pops up Bluetooth pairing request, please tap “Pair”. 6. To sync the latest detailed data to the app, please pull down the main page of the app. Note: The screen can be turned on/off automatically when you just need to rotate and shake the wrist. 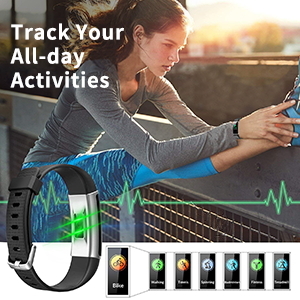 Not only track your heart rate and sleep condition, the smart band will also track your daily activities like steps, distance, calories burned and the minutes you take etc, which help you to get a better understanding of your fitness level. Note: Only 3 modes are preinstalled in the bracelet. Other sport modes need to be added in the App. This fitness tracker can automatically detect your heart rate at anytime. 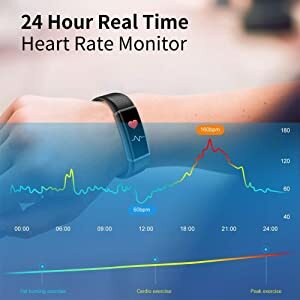 Help you understand your rest heart rate, average heart rate and maximum heart rate, encouraging you to improve your heart health. 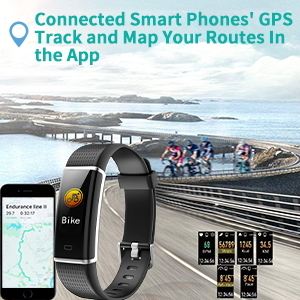 This new style fitness tracker can track and check your running path directly in the app by syncing the data.You will know where you did go when you wear it to walk. Note: Remember to open the App to sync the data. 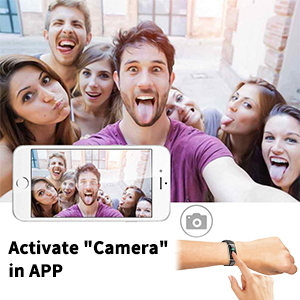 Connected with your phone and open the function of “Camera” in App, then touch the key on the watch to capture the unique moment. Note: The battery may last 2-3 days if you use as much more functions in the App at the same time.